Franklinia alatamaha is a deciduous small tree, growing up to 10 metres tall with elongated, dark green leaves and large white flowers with clusters of golden-yellow stamens. It is the only species in the genus Franklinia. It was first recorded in 1765 along the Altamaha River in Georgia, USA, by botanists John and William Bartram. William Bartram later collected specimens of this species, including seeds which he later successfully propagated. After studying the species he assigned it to a new monotypic genus, Franklinia, named in honour of his father’s great friend Benjamin Franklin. He also reported on the extremely limited distribution of the species as it was only found within two or three acres of ground in acidic bogs. Less than 40 years later, in 1803, English plant collector John Lyon made the last report of this species in the wild. Although there have been numerous expeditions to relocate the plant in the wild, all of these have failed and it is now classified as being extinct in the wild. All Franklin trees today are in cultivation and are descendants of Bartram’s specimens which were cultivated in Bartram’s Garden in Philadelphia, one of the oldest surviving botanic garden in North America. 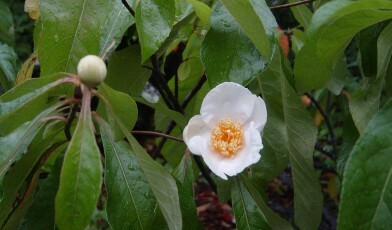 The species is still available for garden cultivation and is prized for its fragrant white flowers, similar to Camellia blossoms, which smell of honeysuckle. Why the species suddenly disappeared from the wild is still not known today. One theory is that a cotton pathogen was introduced into the environment after large areas upstream from where Franklinia alatamaha was found were cleared for cotton plantations, allowing the pathogen to flow downstream and effect the whole population of Franklin trees. Other possible causes include over collection by plant collectors, fires and flooding. Efforts are being made to restore the tree in the wild by planting specimens near the site where they were originally discovered.